1928 Ackland souvenir of the International Philatelic Exhibition card franked with 1928 3d Blue Kooka, tied by 1NO28 Exhibition cancel in red. 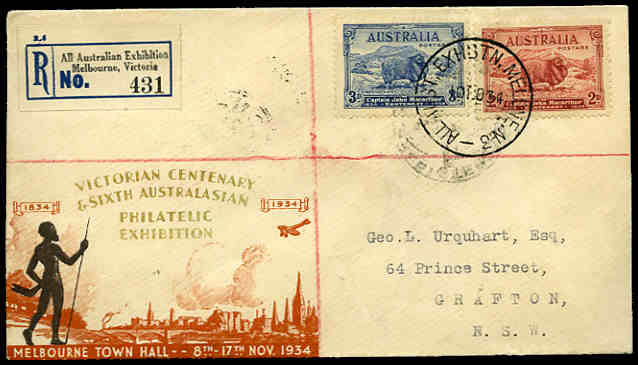 Also 1934 First Flight registered boomerang cover from Australia to New Guinea and 1937 Air Mail Exhibition registered souvenir cover (minor foxing) with special pictorial cancellations and registration label, plus Vignette pair in blue on reverse. AAMC 395 and 768bb. 1934 All Aust. Exhbtn. Melbourne N.3. Special Postmark on Registered Victorian Centenary Philatelic Exhibition cover with Registration label including an extra cancel as a backstamp. Catalogue Value $500.00. 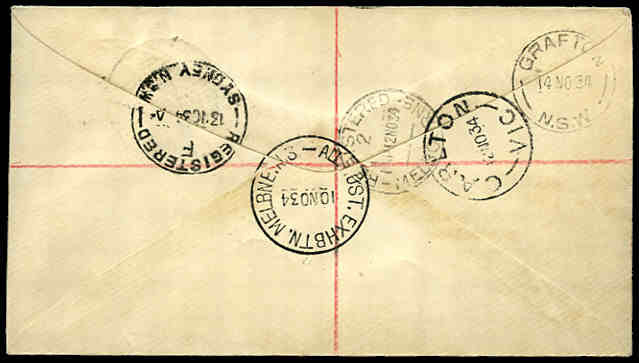 Selection of 237 plain covers from 1955 to 1977 all cancelled with special pictorial postmarks. Good range with some duplication. Collection of 510 covers from 1966 to 2004 all cancelled with different special or commemorative postmarks including many illustrated and Australia Post souvenir covers and some sets. Accumulation of 958 covers from 1966 to 2000 all cancelled with special, relevant or commemorative postmarks including some PSE's and Aerogrammes and many illustrated and Australia Post souvenir covers. Many sets and some duplication. Also 1976 Red, 1978 Blue, 1982 Black and 1982 Natural Heritage postcard packs. 1955 (23DE55), 1957 (23DE57) and 1968 The Summit Mount Kosciusko (souvenir covers), 1966 Inter-Parliamentary Meetings, 1966 Ayres Rock, 1966 Eleventh SEATO Council Meeting, 1966 Society of Haematology and Blood Transfusion, 1966 United Nations ECAFE, 1966 WAPEX (souvenir cover), 1966 Universal Postal Union's Consultative Committee, 1966 Back to Braidwood, 1967 National Camp Langwarrin, 1967 39th Congress of ANZAAS special commemorative postmarks on plain covers, 5 registered. PictorMarks S2, S4, S22, P1, 219, 222, 223, 224, 225, 226A, 227, 230 and 231. 1955 (23DE55), 1957 (23DE57) and 1968 The Summit Mount Kosciusko (9), 1966 Qantas Boeing Flight (2), 1966 Air New Zealand Flight (2), 1966 Inter-Parliamentary Meetings (4), 1966 Ayres Rock, 1966 Eleventh SEATO Council Meeting (6), 1966 Society of Haematology and Blood Transfusion (3), 1966 WAPEX (5), 1966 Universal Postal Union's Consultative Committee (2), 1966 Back to Braidwood (5), 1967 National Camp Langwarrin (2), 1967 39th Congress of ANZAAS (3) and 1967 Mount Gambier to Melbourne First Flight (1) special commemorative postmarks mainly on plain covers. Several souvenir, plus 5 registered covers. PictorMarks S2, S4, S22, P1, 217, 218, 219, 222, 223, 225, 226A, 227, 230, 231 and 232. 1970 Royal Visit set on 22 official unaddressed Post Office commemorative covers, cancelled with commemorative postmark at towns visited. Pictor-Marks catalogue value $250.00. Collection of 398 covers from 1966 to 2008 all cancelled with different special or commemorative postmarks with many illustrated and Australia Post souvenir covers including Flight covers, signed covers and some sets. Accumulation of 793 covers from 1967 to 1990 all cancelled with special or commemorative postmarks including many illustrated and Australia Post souvenir covers and some sets. Many duplicates. Accumulation of 876 covers and Postal Stationary items from 1967 to 2004 all cancelled with special or commemorative postmarks including many illustrated and Australia Post souvenir covers and various commemorative overprints. Noted 1977 Australia/England Test Centenary and 1983 75th Birth Anniversary of Sir Donald Bradman souvenir covers, both signed by Don Bradman. Many sets and some duplication. Accumulation of 610 covers and 550 PSE's from 1971 to 2002 all cancelled with special, relevant or commemorative postmarks including many illustrated and Australia Post souvenir covers, some signed covers and numerous sets. Some duplication. Selection of 517 official unaddressed FDC's, PSE's, Flight covers and souvenir covers with special or commemorative postmarks from 1966 to 2000 including some signed and Australia Post souvenir covers.